Over 61,000 texts were transcribed by the TCP project, everything from hunting manuals to weapon inventories to lyric poems and plays. Important work is being done on this corpus, and it is clear that we are nowhere near exhausting the possible analyses that can be conducted on a dataset of this size (well over 1Bn words). One of the greatest challenges to working with the corpus is that the metadata for its contents — information about the texts that have been transcribed — is inconsistent or absent. If we want to characterize types of writing with the help of statistics, we must first label the items to be compared. To distinguish scientific writing from what was written for the stage, say, we must first ask someone to apply these labels to the relevant items. And labeling involves interpretation. A major challenge we face as researchers peering into this collection, then, is that of identifying what is being compared in the absence of human curated groups. There is another way into the problem, which is so focus solely on the correlations or dependencies among variables — the fact that certain measured features track with and away from one another. We can do this in an unsupervised way, without reference to any human generated metadata. Here we find techniques such as principal component analysis (PCA), which we have used in our own studies. Other unsupervised techniques that do not rely on human generated ground truths would be word embeddings (Word2Vec, Glove) and cluster analysis (K-means, etc). In our past work with Shakespeare, we used unsupervised techniques to see whether this “hands off” exploration of patterns in the data lined up with groupings that humans have already made. We conducted that research on dozens of items rather than a corpus of tens of thousands. That research suggested to us that dependencies among text features track reasonably well with the domain judgments of literary experts. We have always wanted do this type of analysis on a larger scale, but have to this point been stymied by lack of human created metadata for genre. One solution to this lack of metadata would be to take a smaller sample of labeled data grouped by genre, date, or some other criterion, and train an algorithm to identify other, unlabeled members of the group. This technique, called semi-supervised machine learning, leverages human judgment and speeds search in spaces where full metadata is unavailable. Most people take advantage of this partial leveraging of human insights when they search the internet. This method is not appealing to us, however, because it introduces a circularity in the work. Yes, it would be useful to train a classifier that finds poetry in a corpus where no one thought to look. But our goal is not to improve search. Rather, we want to understand, quantitatively and rhetorically, what it is at the level of textual features that would lead a human being to apply a label, as literary critics inevitably do. It’s the behavior that is interesting. This extended blog post asks how our initial approach of comparing unsupervised analysis with independent human judgements would play out if we were to make such comparisons on a larger scale. Such comparisons present a challenge when every item in the TCP corpus has not yet been assigned genre labels by a human whose judgment we trust. A way forward presented itself, however, when the Mellon “Visualizing English Print” project at the University of Wisconsin funded the curation of a sub-corpus of 1080 texts, each of which was assigned a genre label by a team with domain expertise. These texts were drawn randomly from both the EEBO-TCP and ECCO-TCP, 40 per decade, beginning in 1530 and ending in 1799. Taking these 1080 texts as our starting point, we conducted an unsupervised analysis of the the subcorpus using PCA on a group of pre-selected features we had used before — Docuscope’s Language Action Types (LATs). Those principal components were highly interpretable, leading us to propose two statistically-derived, feature-based oppositions that characterize the entire subcorpus. Each principal component expresses the tendency for texts have some features while lacking others. A map of these tendencies appears at the top of this post. What follows in the next section is an analysis that supports the interpretation of this first, map-like diagram. 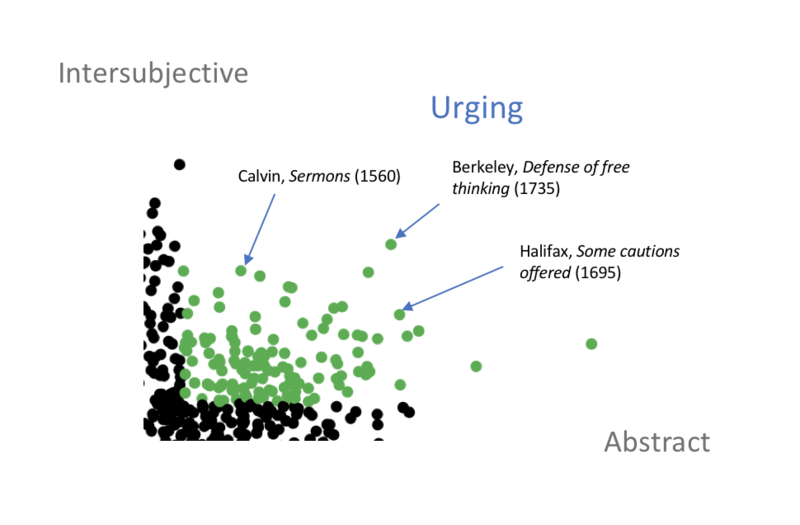 Since these oppositions or axes are mathematically orthogonal, we take advantage of the further opportunity to explore a “four corner” distribution of text types across the two initial rhetorical oppositions. Here too we find that the corner combinations of paired traits (two from each axis) are also interpretable. In confirming those intuitions, we want to suggest again that — on a larger scale than before — unsupervised analysis of defined textual features aligns well with human judgments that never focused on those features. The fact that two independent ways of grouping texts converge is interesting in and of itself, and offers new opportunities to think about generic variation in early modern print texts. But we make a second finding that is more interesting. The patterns arrived at through an unsupervised analysis of 1080 texts are just as discernible, just as dominant, in the full corpus of 61,000 texts. The original four-corner distribution of the labelled 1080 texts is preserved when PCA is performed on the full corpus. This continuity suggests that the map we created of the smaller group — one that shows four basic types of writing distributed around two basic oppositions — can be used to characterize the rhetorical dynamics present in the full TCP. 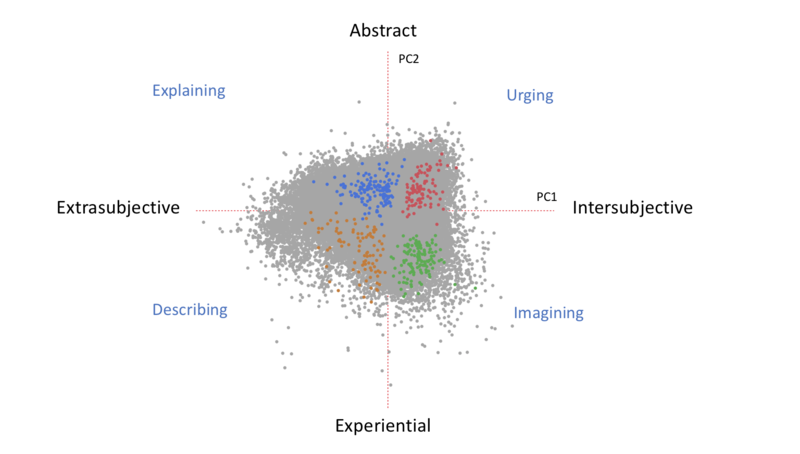 Each of these aspects of the exploration are taken up below in sections treating (1) unsupervised PCA of a subcorpus and our characterization of the PCs using examples; (2) the superimposition of labeled genres onto these derived components; (3) a study of combinations of the PCs that can be used to create a four quadrant rhetorical map of the corpus; and (4) an application of this map to the full TCP. Our goal in publishing the blog post is to demonstrate how one might use unsupervised techniques to redescribe dynamics in a corpus that lacks full metadata, and to do so “from the bottom up,” using examples. The resulting document is long, but we feel it captures every link in the chain of reasoning, including the examples that came to inform our interpretive choices. Principal component analysis or PCA is a well understood statistical technique for describing the dominant directions of variance in a dataset. The technique is often viewed as rudimentary in comparison to other techniques of dimension reduction. This is because PCA assumes linear relationships among the features counted in texts: it draws straight lines in a dataspace, whereas more custom “classifiers” can curve around exceptions. But PCA’s requirement that components be independent (mathematically orthogonal) means we can understand the relationships among components in a way that is geometrically intuitive. In this section we try to understand the components derived from the 1080 corpus and then map them onto a space that we can interpret. The first principal component (PC1) produced in the analysis describes a pattern that we call Abstract/Experiential. Texts scoring high on PC1 tend to relate matters according to the necessity of argument, logical entailment, or moral obligation. We call texts scoring high on PC1 Abstract, and those that score low Experiential. PC1 represents the difference between what is and what must be; it covers what gets related via the mediation of concepts and arguments (Abstract) versus a world of sensory experience (Experiential). Abstract texts work to guide readers through relationships of logical entailment or social obligation with some argumentative apparatus. Experiential texts, on the other hand, tend to relate person-to-object or person-to-event relationships in the first person, but not person-to-person relationships. The second principal component (PC2) spans a continuum we are calling Intersubjective/Extrasubjective. Dynamics along this span are uncorrelated with the action we see on the first (described by PC1). Intersubjective texts depict the inner lives of people who are coming into contact with one another, whereas Extrasubjective texts convey impersonal relationships among abstractions and/or physical objects — relationships that are not disclosed via the inner life of a specific person. Intersubjective texts tell us why people are doing what they are doing, and disclose information as it relates to evolving intentions and circumstances. Extrasubjective texts, by contrast, present a world whose existence sits at arm’s length from the inner life of any particular onlooker or speaker. Extrasubjective texts assume the givenness of concepts/objects that are then placed in some kind of logical/spatial relationship with one another. Readers will notice a series of names under each of the directions in the biplot (“Self Disclosure .22” under the Intersubjective pole of PC2, for example). These names identify LATs that contribute positively or negatively to an item’s score on a component. Position on the x-axis, for example, is a function of an item’s having and/or lacking the LATs listed at either end of the axis. The LATs contributing to a text’s high score on the Abstract pole of PC1 — the LATs that move it to the right of the plot — are Specifiers, GenericEvents, ReasonBackward, and CommonAuthorities. Conversely, LATs lowering a text’s score on PC1, moving it to the Experiential pole at left, are Motions, FirstPerson, SenseObject, and SenseProperty. 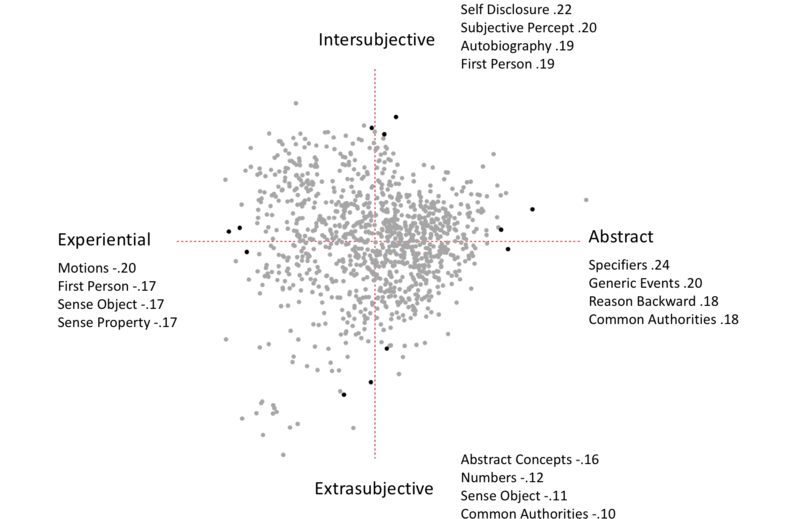 So too, Intersubjective texts at the top of the plot are characterized by high scores on SelfDisclosure, SubjectivePercept, Autobiography, and FirstPerson, whereas Extrasubjective texts have high scores on AbstractConcepts, Numbers, SenseObjects, and CommonAuthorities. The names we have given to the component axes here are interpretive. 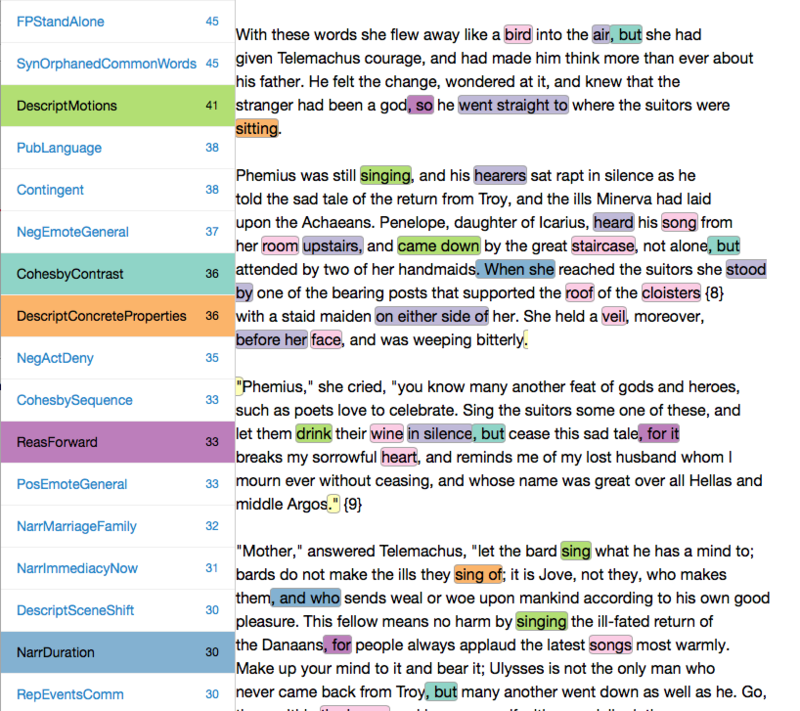 We arrived at these interpretations by using a tool created by the VEP project — the SlimTV viewer — which offers color coded versions of the texts that correspond to the different features counted in the analysis. That tool allowed us to inspect the relevant (strongly loaded) LATs in context using example texts at the far ends of both axes. We move now to explore twelve of those examples. The views we present use color coding to call out the LATs (words and sequences of words) that are pushing items to the far end of the axes, making them good examples. 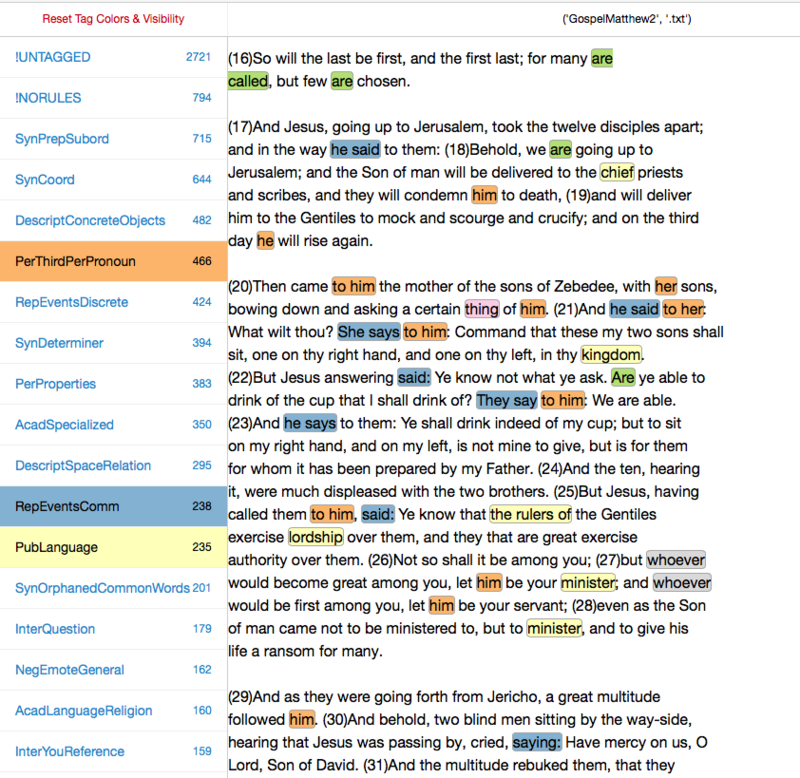 The SlimTV viewer allows interactions through a browser, so readers can independently consult full, LAT-highlighted HTML versions of the twelve examples discussed below by following the links. We present an abundance of examples (and links to full tagged text) so that readers can understand how we arrived at these distinctions — Abstract/Experiential, Intersubjective/Extrasubjective. Readers are invited to skip ahead or explore further as necessary. Abstract example 1: George Berkeley, Passive Obedience (1712), tagged text, plain text. Berkeley’s treatise on the rational grounds for submitting to civil power guides its reader through a series of intellectual possibilities, using abstract nouns to shorthand the particular political situations (“cases,” “Occasions”) that he wants to subsume under general headings. This is the flow of logical argumentation, where the process of reasoning itself is managed through the use of (blue) Specifiers that show where the narrator is in the argument (“concerning a”, “in which every”, “concerning a”). Red GenericEvents words detach a moral or political action from any specific actor (“to be” done, “Actions”) so that it can be related to broader obligations (“Doctrine,” “necessity, “the Common Weal”), which Docuscope tags as (purple) CommonAuthority. A verb, “premised,” tagged as (green) ReasonBackward, connects a prior argument to a more recent one. An exemplary Abstract text, Berkeley’s treatise uses these characteristic words and phrases to coordinate a flow of ideas within and for a well-ordered mind. Abstract example 2: William Prynne [attributed], The Long Parliament twice defunct (1660), tagged text, plain text. In Prynne’s treatise on the dissolution of the Long Parliament, we see the author placing a set of (purple) CommonAuthority nouns — “Government,” “Fundamental laws” — in logical relation to one another via the (green) ReasonBackward words (“because”, “as it is”). Prynne provides a window onto the process of ideas unfolding in a well-regulated mind, where the flow is motivated by relations of logical entailment rather than a contingent sequence of historical events. The scope of reference is restricted or directed with specifiers (“the whole”, “all the rest”, “part of the”), words that are necessary here because all reasons do not apply to all things. The language in this passage works to keep concepts from descending into particulars. That general elevation is accomplished through the use of (purple) CommonAuthority nouns on the one hand and — on the other — analogies that refer to no specific historical situation. He refers to housebuilding in general, for example, not the construction of a specific gatehouse in Blackfriars. Prynne’s text manages the attention of the reader by making sure particulars of any one person’s experience do not come to qualify his abstract claims. Abstract example 3: Edward Fowler, Certain Propositions, By which the Doctrine of the H[oly] Trinity Is So Explained (1694), tagged text, plain text. Edward Fowler is a Gloucestershire Bishop who, in Certain Propositions, sets out to defend claims about the Trinity from criticism. In doing so, he coordinates the objections of his opponent with his own refutations, adducing distinctions from another text to warrant his response. Not surprisingly given the context, (purple) CommonAuthority words — “God” and “Scripture” — are prominent, as are (blue) Specifiers that identify precisely which parts of an earlier argument he is addressing (“in reference to,” “with the,” “each of which”, “the whole”). The most frequently tagged phrase under (red) GenericEvents is “to be,” a passive construction that allows the writer to introduce a judgment (“justly to be here Charged”) without himself taking ownership of that judgment. Experiential example 1: Jerningham, Yarico to Inkle (1766), tagged text, plain text. Yarico to Inkle is a “heroic epistle” by a late 18th century English nobleman; it is delivered in the voice of Yarico, a female African slave who rescues a European mariner, only to have him turn on her and sell her (and their child) into slavery. This first textual example of the Experiential pole lacks the logical connectives and abstraction of its opposites above; what holds together the flow of items as expressed in the text is a consciousness that characterizes entities based on sensory properties. At one moment, we are focused on the ear and what it hears — “accents”, “waves”, the “limpid Stream.” These words co-occur with (blue) Motion words that generate the sensory layer being reported. Here is the stream that “glides”, the sail that flies, the “tempest-beaten” side, the “flow” of language from lips. The verbs highlighted in the example indicate a change in state of a physical thing, often a body, as opposed to some more generic reference to an event (as we saw in the examples on the other end of PC1). It should be no surprise that the (blue) motion verbs accompany other items tagged as (green) SenseObjects — “stream”, “bower”, “sea”, “lips”. Finally, the (red) FirstPerson tokens anchor this flow of sensation to the narrator who is the collecting center of that sensory experience. Experiential example 2: Kane O’Hara, The Golden Pippin (1773), tagged text, plain text. The Golden Pippin is an eighteenth century burletta written by the Irish composer Kane O’Hara. In Pippin, characters express outsized feelings about events in the narrative through individual arias, all reliant on the use of (red) FirstPerson LATs (here, “I” and “my”). As one might expect in a story about an apple (“pippin”), there are plenty of opportunities to name (green) SenseObjects and their (purple) SenseProperties in vivid language (“windows,” “wifes,” “puppets,” “Sky,” “Sultanas,” “Pippin,” “dripping,” “running,” “tripping” tagged with SenseProperty and SenseObject). But the language also conjures things and actions that are not being enacted onstage. The singer here, a fantastical character named Momus, describes how he will torment others — “On wires I dance ‘em all.” A text in which actions (past, imaginary, or future) are recited rather than enacted will require this form of sensorily rich language characteristic of the Experiential pole of PC1. The aria belongs at the Experiential pole of the distinction because, formally, it is a first person super narrative of sorts. In it, the singer sets out the chess pieces and then puts into motion to illustrate what has happened, might happen, or will happen. Experiential example 3: H. Bate Dudley, Airs, Ballads…The Blackamoor Washed White (1776), tagged text, plain text. The several airs in this text, once sung as part of a comic opera that included Sarah Siddons, express the vicissitudes of lovers as they progress toward nuptuals. The pastoral scene rendered by words such as “lyre,” “tree,” “skies,” and “beechen” (SenseObject, SenseProperty) make sense as part of the recital of plot events; but there is also sensory language being used to characterize the singer’s situation metaphorically — a schoolboy stealing sweet honey from a bee. The sensory language and (blue) Motions, then, are used not simply to communicate plot events that may not have been enacted on stage, but also to paint internal feelings by analogizing them to a sensory scene. The resources of (red) FirstPerson, which supports the sensitized reporting of actions, extend beyond a simple need to report events that advance a narrative; that language can also be used to strike an attitude toward plot developments by recasting them as another sensory scene. Intersubjective example 1: Thomas Holcroft, Anna St. Ives (1792). Tagged text, plain text. Anna St. Ives is the first British Jacobin novel; it was written by Thomas Holcroft. The narrator is describing an encounter with a Mr. Henley who is reluctant to begin a conversation about the narrator’s relationship with his daughter. Each of the two characters discloses something of his inner life; the entire exchange is related from the perspective of one person who both recounts and interprets it in (purple) FirstPerson. For example, the narrator wants the reader to know that he’s anxious for Mr. Henley to say what’s on his mind (“My own wish that he should be explicit was eager”), which then motivates the exchange from the standpoint of the narrator (“my own wish”). 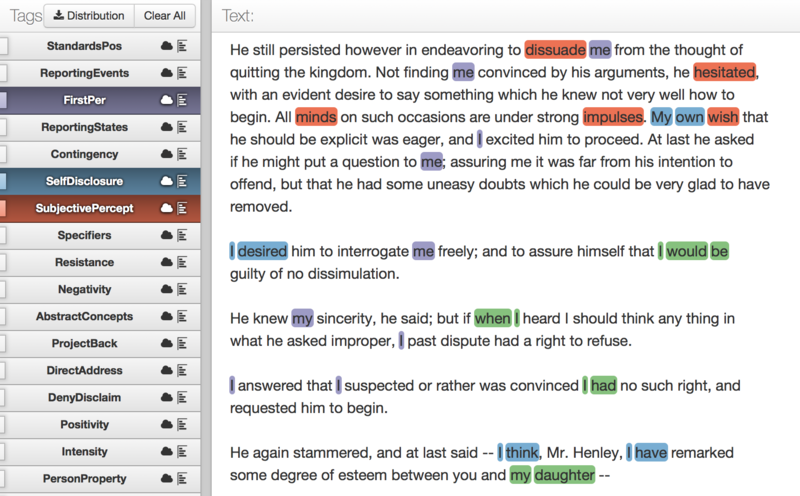 The meeting of minds in recounted dialogue is mediated through (red) SubjectivePercept words such as “dissuade,” “hesitated,” and “minds,” along with (blue) SelfDisclosure words (“my own”, “I desired”, “I think”.) In comparison with passages that exemplify the opposite pole of this pattern, these words mark the fact that the actions and pressures in the scene are internal to someone, not something. Autobiography features (green) register a character’s awareness of a life history (“I had”, “when I”), implying a subject whose past states and relationships (“my daughter”) are recallable in the present. (Autobiographical features imply a social, developmental subject.) As a representative of the Intersubjective pole, then, this passage from Holcroft depicts the inner life of one “me” making contact with another. Intersubjective example 2: Samuel Richardson, Clarissa (1748). Tagged text, plain text. In this passage from Richardson’s Clarissa, the eponymous narrator is telling Miss How about the hostile reception she received from her own family when she was called home from an earlier visit to Miss How’s house. In the recounted scene, Clarissa’s family forces her to justify the fact that she has been spending time in the presence of a Mr. Lovelace, her brother’s sworn enemy, while at the How residence. Clarissa must first narrate what happened in Miss How’s company and then state what her real intentions were, a move that forces her to alternate between (green) Autobiography (“I was”) and (blue) SelfDisclosure (“I would”). The alternation between “I was” and “I would” occurs frequently in the novel (twice in this passage); it demonstrates the narrator’s tendency to pivot between recollection of past events and vocalized reaction to those events. Words that imply judgments about, or interpretations of, a social situation — (red) SubjectivePercept (“like to have”, “even”, “voluntary”, “tacit”) — give insight into relationships among actors in a social situation. The abundance of accusative case “me” tagged as (purple) “FirstPerson”, moreover, mark the fact that the things being described are placed in relation to the narrator — to a narrating “me.” In using these features together, Richardson provides a rich view onto a consciousness that is both socially aware and able to render that awareness through recounted action. Intersubjective example 3: Fanny Burney, Cecilia, vol. 3 (1782). Tagged text, plain text. In this passage from Fanny Burney’s Cecilia, Cecilia and Mrs. Belfield discuss Cecelia’s interaction with Mrs. Belfield’s daughter, Henny. This passage provides another example of a “meeting of minds,” one in which a speaker (Mrs. Belfield) speculates on the intentions that informed “the little accident that happened when I saw you before,” when an “odd thing” (red SubjectivePercept) happened. The (green) Autobiographical features are necessary, even in small amounts, because Mrs. Belfield needs to relate a past event (“when I saw”) to the thinking she now unfolds, a sequence that discloses her own perspective on the story (“I mean to say”). Inevitably, that process is colored by subjective judgments (in red, “got the upper hand”, “just as well”) which are themselves anchored in the (purple) FirstPerson pronouns used by the quoted speaker. Extrasubjective example 1: Edward Donovan, The Natural History of British Insects (1801). Tagged text, plain text. Edward Donavan’s Natural History is the first example of the Extrasubjective pole of PC2, and illustrates the tendency to relate objects of experience without explicitly locating them in a particular consciousness; those objects are available to any person whatever, who in the case of these texts is the reader. As one might expect in a natural history text, there are plenty of declarative sentences. Here (red) Numbers are used to coordinate bibliographic sources (“Vol. 111”) and to coordinate reference points (“two others on oaks”), which has the effect of locating authority outside the narrator. SenseObject items (green) are picking out concrete things in the natural world (“Habitat,” “willows,” “moth,” “abdomen”). AbstractConcepts (blue) are abstract nouns (“species,” “English,” “country,” “descriptions”) as well as symbols (p.). The (purple) CommonAuthority phrase — “the general” — situates the quoted description outside the realm of private opinion, just as the “We” pulls the frame of authority outside of the embedded narrator. This passage is very much of a piece with the emerging rhetoric of the scientific report, hewing to Bishop Sprat’s rhetorical ideal (in his praise of the Royal Society) of trying to keep words tied to things. Extrasubjective example 2: Decree, Charles by the Grace of God (1633). Tagged text; plain text. This Extrasubjective passage differs from the first in that the decree relates official actions and information relevant to those actions; it exceeds the consciousness of any one narrator or individual because the affairs of state are by definition larger than any one person. 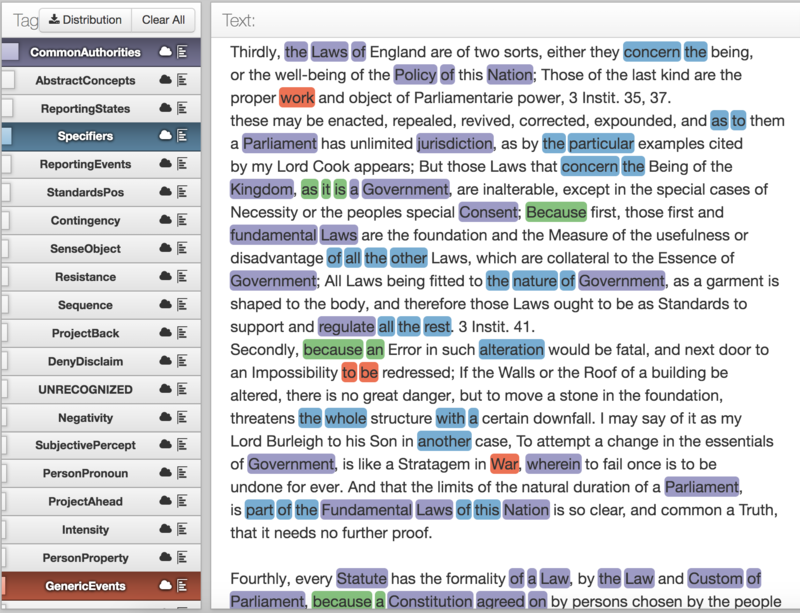 The passage references only a few (green) SenseObjects (“penny”), and when it does, the writer uses it as a means of coordinating amounts of time and resources (years, pennies, Feast) with the authorities who control those resources (purple CommonAuthority words such as “Parliament,” “Sherrifs,” “regalities,” “Kingdom”). As is the case with many Royal decrees concerned with resources, amounts need to be spelled out so that they can be understood and honored, which is why there are so many (red) items tagged with Number. Extrasubjective example 3: Robert Norman, A discourse on the variation of the cumpas (1581). Tagged text, plain text. Robert Norman was a sixteenth century navigator who discovered magnetic inclination. In his 1581 Discourse on the compass, he reports observations that show variations along the horizontal plane of the magnetic needle. The highlighted passage shows, once again, the quick succession of (red) Numbers and (blue) AbstractConcepts — “variation,” “account,” and “observation” — words that refer to abstract relationships (differences in angles) or intellectual actions (observing, accounting). References to specific measurements that are the subject of argument are then anchored to a (green) SenseObject — the “Sun” — and an AbstractConcept (“Horizon”), both of which are the phenomenal supports for the abstract reasoning on display here. Norman’s Discourse illustrates the Extrasubjective pole of PC2 because the concepts it appeals to are the objects of geometric demonstration and so by definition not unique to the consciousness of an individual at a given moment. This is not to say that a living person did not observe the things related by Norman; presumably they were. The passage is Extrasubjective, however, because Norman’s manner of relating his observations shows them to be products of a mind whose interests arise from the interaction of physical objects and concepts, not the social relations of unique moral beings. We have focused in the foregoing analysis on the specific language (LATs) whose distribution suggests two places where the energy in the system lives, energy being a metaphor for significant correlations or dependencies among multiple features. PC1 and PC2 explain 7.1% and 5.2% of the variance in the corpus (respectively), providing a feature-based map of two powerful dynamics or oppositions that separate texts in the 1080 subcorpus. No act of human labeling contributed to the positioning of items in this space. In this section, we pause to ask how a set of independent interpretive judgments about literary genre might map onto the statistically derived PCA space discussed in the last section. Do genres fall out along lines that correspond to the axes as we have presented them? We have several observations to offer on the these groupings of genres around the two axes. First, the groupings of human labeled groups along these axes make a certain amount of sense. It is not hard to accept that “legal decrees” are Abstract — that they use CommonAuthority words in sequences that specify logical, legal, or moral obligations. Nor is it surprising that texts characterized as “narrative verse” are full of FirsPerson words. It is also unsurprising that “fictional prose” and “drama” texts would be Intersubjective, while “science” and “medical” texts are Extrasubjective. (Links to sample texts, labeled by genre and classed according to the four poles, can be found in an Appendix below.) There is, then, some intuitive overlap between the statistical oppositions and the arrangement of texts across those oppositions by genre. We also observe that verse forms of all kinds, regardless of subject, tend toward the Experiential pole. 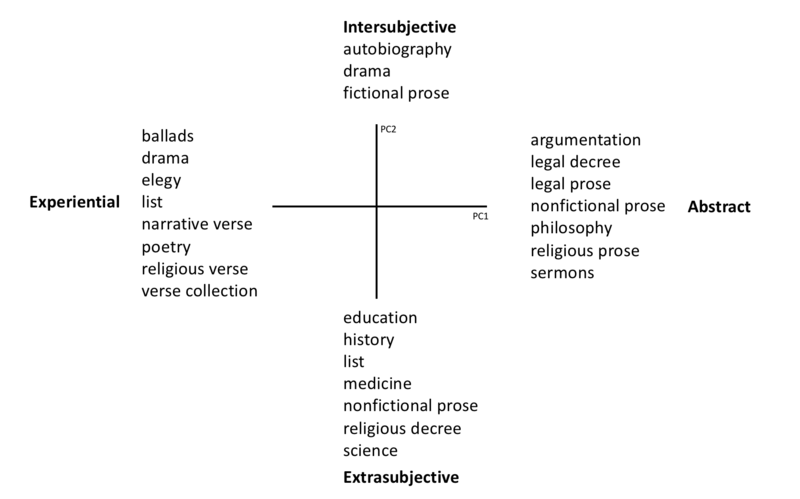 Even when the subject matter is largely the same — as with “religious verse” and “religious prose” — the use of verse throws an item to the Experiential side of PC1. It is not surprising to learn that early modern verse is full of images and is expressive (anchored in the first person). But it is interesting to see a close link between verse forms of all kinds and sensory language. That pairing tells us that, even when verse is relating concepts or interior states of mind, it reaches for sensuous objects and events in order to render them. Verse does not prosecute an argument; rather, it sets things out for a reader to experience. 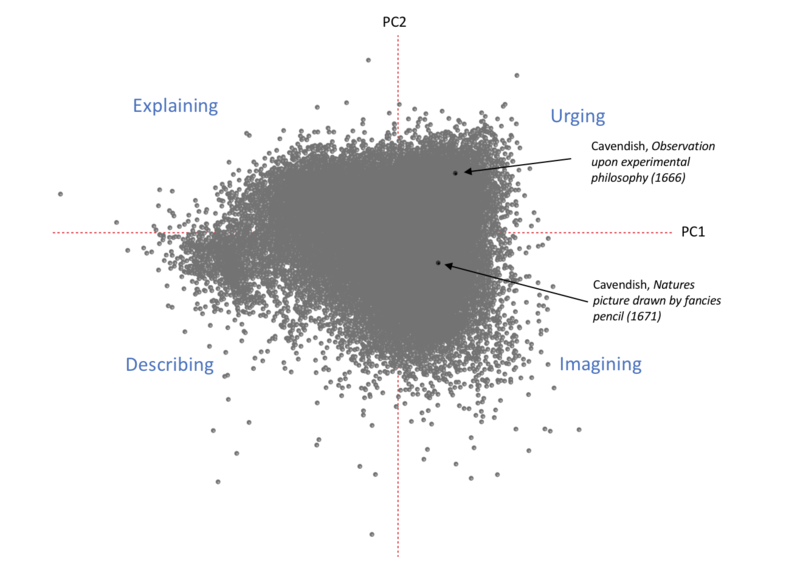 A third observation deals with narrative, which spans both sides of the continuum of PC2. Fictional prose, drama, and autobiography are all narrative forms. They favor the Intersubjective pole. But history and nonfictional prose also rely on narrative sequence, and they are Extrasubjective. The fact that narrative spans both ends of PC2 suggests that narrative sequence can be used to accomplish two pragmatically different tasks — relating interpersonal events in the social world (Intersubjective), or relating events that have a purely physical or “historic” and so impersonal character (Extrasubjective). The distinction represented by PC2, then, seems more basic than any distinction we might propose between texts that employ narrative sequence and those that do not. A final observation deals with the fact that so few genres score significantly higher or lower on both principal components. This is the case only with lists and drama, both of which are formally rigid in ways that perhaps other texts in the corpus are not. Leaving stage directions aside, drama texts consist entirely of speeches in the first person, whereas lists are table-like and are meant to be scanned discontinuously as well as read serially. It is not clear why two of the most formally constrained types of text in the subcorpus participate in both patterns whereas others participate in only one. It makes sense, however, that plays would be an extreme version of the mixture of Experiential and Intersubjective, while lists are a stark combination of the Extrasubjective and Experiential. The advantage of having a map of the whole space is that an item in one quadrant can be related to all the others. Drama is drama, for example, because it is not Abstract and not Extrasubjective (in the way we have been using these terms). Descriptions of sets of items, then, can be positioned within a larger cultural field. We characterize the corners of this PCA in terms of the stance or actions they take. Those actions can be “Urging” (Abstract and Intersubjective), “Explaining” (Abstract and Extrasubjective), “Describing” (Experiential and Extrasubjective), and “Imagining” (Experiential and Intersubjective). After surveying examples in each, we discuss the significance of this fourfold division for our thinking about early modern texts and ask how these labels are different from the genre or period labels we usually use to talk about texts in groups. Selected items that participate in two patterns at once are highlighted with a different colors. In a subsequent section, those selections and corresponding colors will “carry over” into a projection of the entire corpus. Explaining. Unlike “Urging” texts, “Explaining” texts locate their own authority in objects or impersonal concepts rather than an individual. 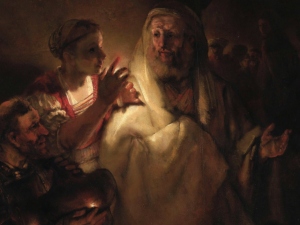 Texts in this quarter tend to be scientific writings or legal decrees and proclamations — texts in which an impersonal authority or method (geometry, empiricism, theology, the crown) is making the connections between entities encountered by the reader. Describing. 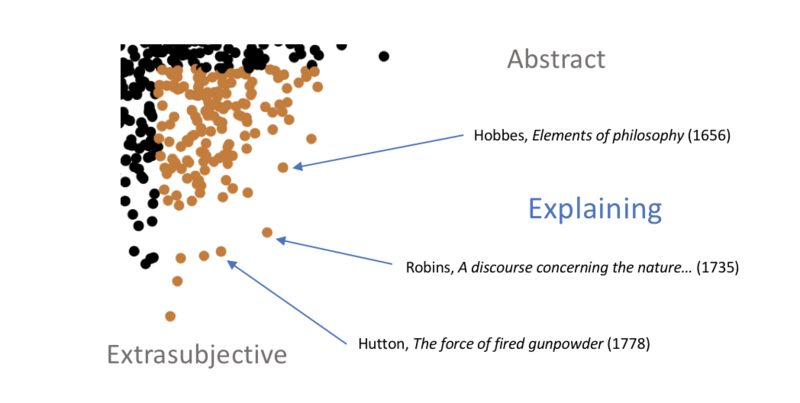 “Describing” texts tend to be more inert rhetorically, enumerating physical events and objects rather than subsuming them under organizing concepts. Texts in this quarter include natural histories and lists (location surveys, catalogues of military equipment, geographical antiquities), which tend to be dialectically unstructured. 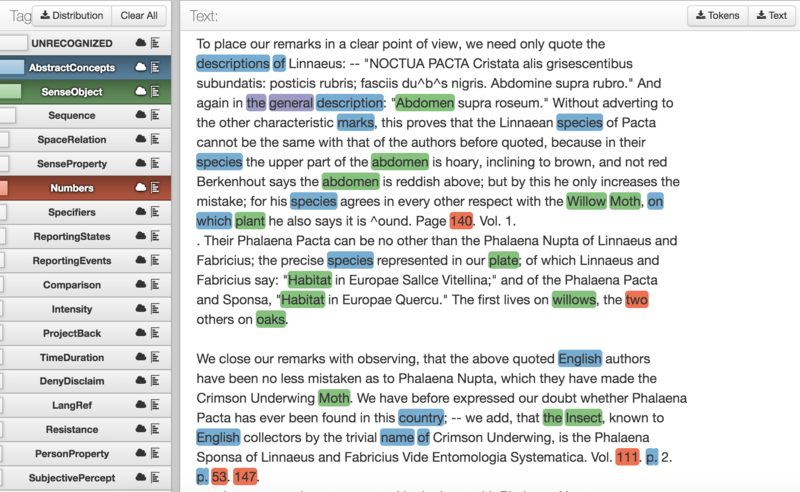 A cluster of Latin texts can be found in the lower left, placed there because of the high degree of “AbstractConcept” words that Docuscope recognizes in them. To review before moving to the next section, we have used a nonsupervised statistical technique to call attention to language (LATs) that can help us describe dependencies we see in the corpus. 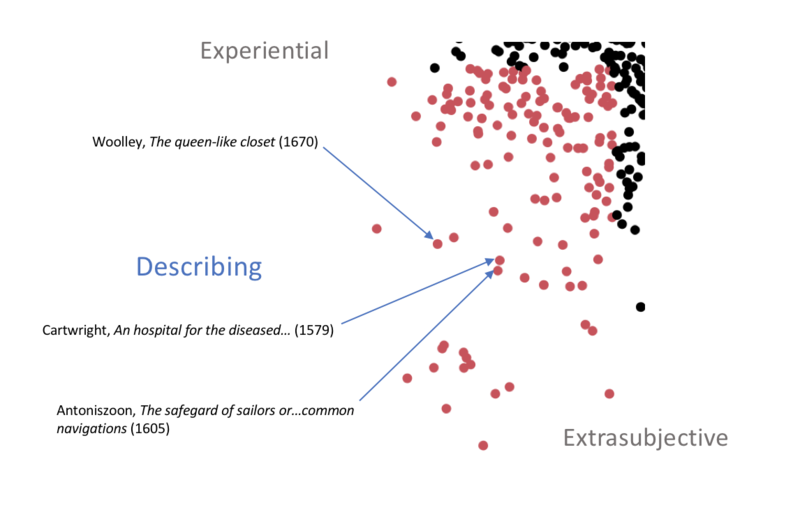 Having identified two basic patterns — Abstract/Experiential, Intersubjective/Extrasubjective — we have shown how these patterns can be used to sort genres derived independently by human study and expertise. 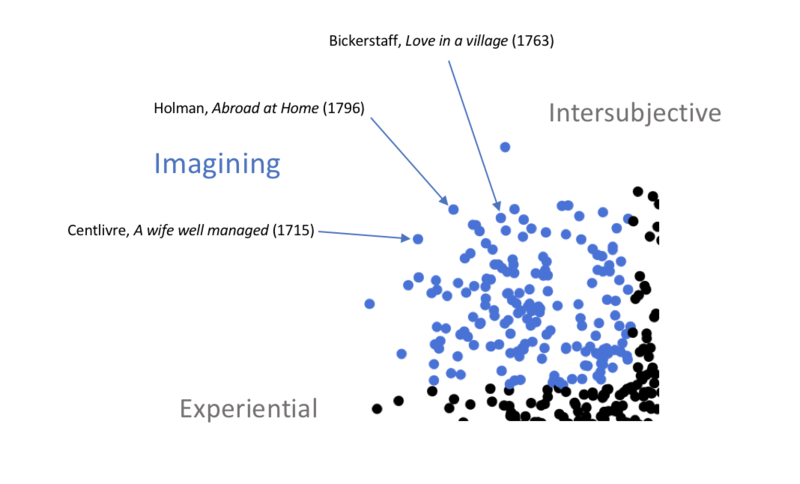 The distribution of the human labeled items according to genre made intuitive sense when plotted according to the patterns (PCs 1 and 2) arrived at independently by nonsupervised means. Returning to those two initial patterns, then, we explored the corpus in terms of combinations of each, defining four rhetorical tendencies in the corpus: “Urging,” “Explaining,” “Describing,” and “Imagining.” We now discuss how this interpretation of the corners of the PCA plot for 1080 texts might help us understand the dynamics of the full TCP corpus. While some of the loadings have shifted, rotating the pattern clockwise slightly, the original highlighted items still distribute into recognizably orthogonal sectors. The overall pattern persists. We can note here that the shift in rotation and in the order of components is due to the fact that the 1080 corpus randomly sampled 40 items from each decade spanning 1530-1799, which gave a greater weight to decades with fewer items and reduced the weight of items in decades with more titles. 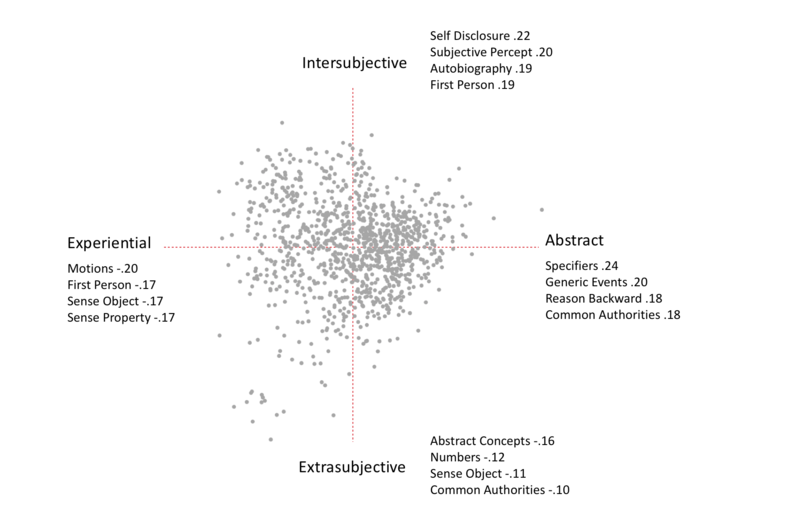 The PCA plot at right captures all texts in every decade, which results in a stronger opposition between Intersubjective and Extrasubjective texts. But the overall set of oppositions remains the same; the positions of the “Imagining” and “Urging” corners have flipped. What becomes clear immediately is that the corpus is unevenly curated. Some of the major time shifts in components are caused by different mixes of texts that were transcribed based on the underlying bibliographies — Pollard and Redgrave STC 1, Thomason Tracts, Wing’s STC 2, ECCO, Evans. These bibliographies cover different periods within the overall sequence of 1420-1820. Within each decade, for example, survival rates will differ based on whether that decade is early or late in the sequence. Selection principles governing which items within those constituent bibliographies were transcribed into the TCP are also inconsistent. And in at least one instance (Thomason Tracts), texts survived because an individual made a concerted effort to collect and save certain types of materials. Looking at the period from 1640-1699, we see that these decades contain many more items than the prior decades, evidenced by the smaller standard deviation bands surrounding the mean measures during this period. This change is due partly to historical events, since the English Civil War led to a profusion of political pamphlets, and so, a larger number of discrete documents that could be transcribed and measured. The change in the number and types of texts captured during this period also reflects that fact that political tracts from the period were systematically collected by a printer named Thomason. These “Thomason Tracts” (1640-1661) were transcribed as part of the EEBO-TCP project, and so represent a distinct curatorial tradition and bibliographical source. Major shifts in measurements on the principal components occur in these two decades (discussed below), after which point the corpus represents mainly items from the Wing STC catalogue (1641-1700), which does not favor political tracts and is comprehensive. Beginning in 1700, the corpus transitions to items drawn from the ECCO-TCP project (Eighteenth Century Collections Online) and items from Evans (early American literature). The coverage and generic range of titles decreases suddenly in 1700, which we see in the pronounced shifts in PCs 1 and 2 at this point. Differences in curation cannot be the only factor at work in these time based shifts, however. Around 90% of the available unique titles printed during 1475-1700 were transcribed for the TCP. If the contributing bibliographies were reasonably comprehensive, then at least some of the movement we see during these years is due to underlying cultural factors. The transition between the 1630s and the 1640s for example — bibliographically, from Pollard and Redgrave’s Short Title Catalogue to Thomason and Wing — is culturally significant because it marks the transition to open military hostilities connected with the Civil War. In the 1640s, for example, we see a sharp movement toward the Abstract and Extrasubjective patterns described above. Taken together, these shifts move texts toward the “Explaining” quarter of our map. There might be historical reasons for such a movement: the response to the Civil War in print was, in effect, to litigate the conflict through declarations and decrees, particularly in the first decade of 1640-49. The Licensing Order of 1643 effectively made Parliament a censor for print publications, and this ongoing censorship would have narrowed the range of what was published. That shift is quite visible in the plot above. During the second decade of the conflict (1650-59), texts remain at an all time high for their measurement on the Abstract pattern (PC2), but now they are more Intersubjective (rising PC2), suggesting movement toward the “Urging” corner in the PCA plot. A crude interpretation of this sequence of shifts would be that civil conflicts occurring in the earlier decade (1640-49) needed to be defended “legalistically” in print — essentially, an explaining task. From 1650-59, however, arguments appear to become more subjective, grounded in moral exhortation rather than impersonal decrees. The regicidal sequence, one might say, begins with explanation, and ends with exhortation. The sudden rise in explanation following a political upheaval returns in the immediate aftermath of the Revolution of 1688, when once again we see a shift toward “Explaining” (falling PC1 toward the extrasubjective; rising PC2 toward the abstract) during the decade 1690-99. Here we may be seeing the effects of the expiration of the Licensing Order in 1694, which allows a greater diversity of items into print once Parliamentary control lapses. The shift might also reflect changes in political and cultural climate that follows the installation of William and Mary in 1689, a “bloodless” revolution that would have to be explained procedurally in print. A second noteworthy movement occurs at the beginning of the eighteenth century, just as the TCP corpus begins to be populated by a mix of American items (from Evans) and the texts gathered in ECCO. Here the change in inclusion criteria helps us account for the dramatic shifts in PCs 1 and 2, since only certain items from a much larger possible corpus were transcribed. Beginning in 1700, we wee a sharp movement toward the “Imagining” quarter of the PCA space, with texts becoming simultaneously more Intersubjective and Experiential. Some of this pattern must be explained by the tendency to include famous works of fiction in the corpus by its creators and sponsors. But this period also coincides with the rise of the epistolary novel and fictional prose, forms that regularly relate lived action through the bounded perspective of social beings. The rise in this pattern may thus also reflect the increasing presence (and cultural success) of the novel over the course of the eighteenth century. That source is being added to the “signal,” even if we may not be seeing the full spectrum of printed texts from the period. Toward the end of the eighteenth century, the TCP texts retain a high level of Intersubjectivity with respect to earlier decades in the corpus, but become even more Experiential (i.e, the movement of PC2 in red continues down). By 1799, TCP texts are more likely to express the values and judgment of an individual speaker, but are also much more likely to express those judgments with respect to physical objects and actions in the world. The textual world in this part of our sample is perhaps more clearly one of social experience; actions following each other causally as in a story or experimental trial, rather than concepts enumerated in sequence (first, second, third) as they would be in a more abstract presentation. Manual inspection of those texts scoring high on this measure throughout the eighteenth century shows them to be practical texts about medicine, the human body, and human conduct (often warning of the connection between conduct and ailments). A detailed study with new genre metadata might confirm or disprove the hypothesis that a strain of Consequence-rich writing is connected to science and the practical focus of American publishing, both of which figure prominently in the texts selected for transcription within these decades. Fictional prose texts — the newcomer on the scene in terms of imaginative writing — may also use this feature more than drama, its imaginative predecessor. 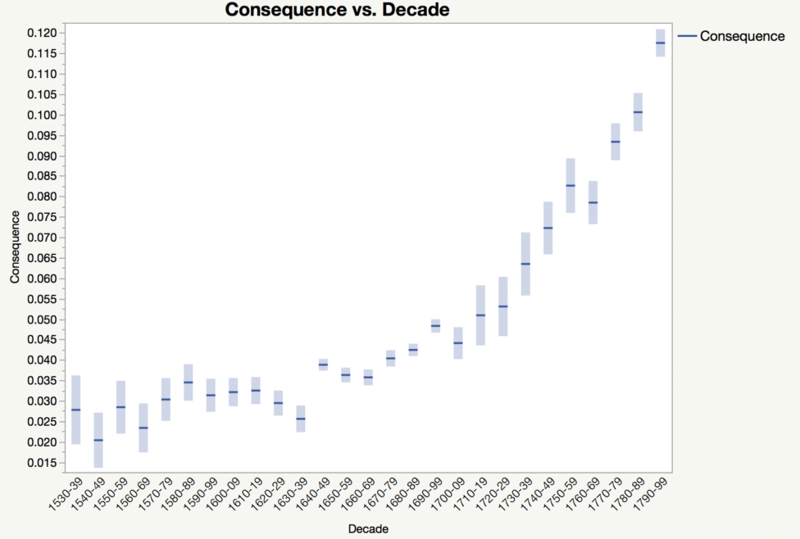 It is equally possible that the rise in Consequence language simply reflects the fact that this LAT counts later expressions of causal or consequential thinking, whereas earlier instances go uncounted. We have shown that we can apply what we learned from a small part of the TCP to the entire corpus, even when metadata for the whole does not exist. Part of this work was interpretive; we characterized and named the patterns PCA found in the smaller corpus after exploring relevant features in example texts. The work was also confirmatory. When we introduced genre labels produced independently (via reading) into a feature space derived from PCA, genres distributed intelligibly across that space. Our final task was to see if this “map” could be understood in light of bibliographical traditions and historical events. We saw, first, the effects of uneven corpus curation and competing bibliographic traditions in decade by decade comparisons. We also noted the possible effects of large scale political, intellectual and cultural shifts — the Licensing Act of 1643, the English Civil War and Revolution of 1688; the rise of science and “practical” writing; the development of imaginative prose fiction in the epistolary novel. If cultural effects can indeed be seen with the aid of quantitative proxies, we should acknowledge that there is a pragmatic side to communicating in print that is by nature repeatable, but also adaptable. As the literary critic I. A. Richards argued almost a century ago, texts have particular means they use to create their effects within readers, and those means are stable enough to study. It is no accident that few writers in the seventeenth century choose to publish lists of military assets in the form of a dialogue, or that legal proclamations were not set in blank verse. Such choices would be impractical in the Richardsonian sense. That is not to say they are impossible choices. But they rarely happen. When, on the other hand, a writer chooses what seems to us an unusual strategy — say, when Margaret Cavendish decides to convey metaphysical truths about nature in a verse romance, as she does in Natures picture drawn by fancies pencil (1671) — we can begin to understand her novelty or lack of novelty as a writer, doing so with an actionable vocabulary we could never have created through selected reading. 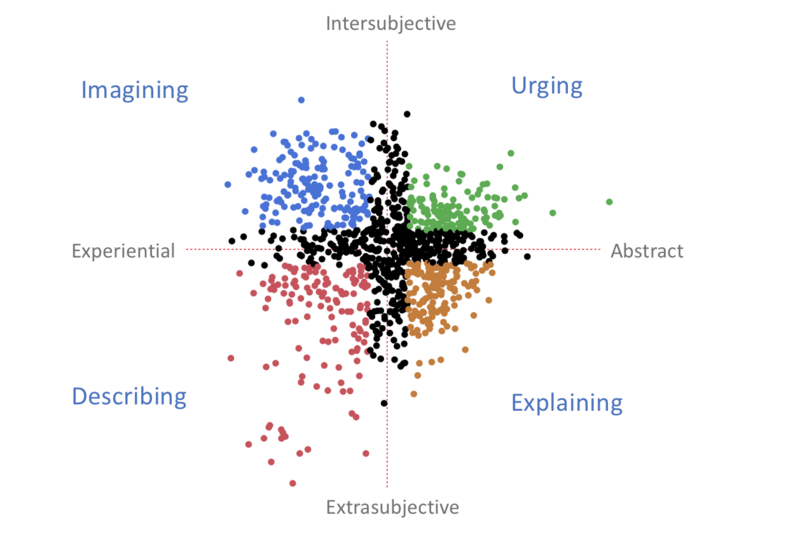 Individual writers employ strategies from different regions of the map, and those differences suggest the constrained diversity of approaches they bring to making meaning. It also speaks to the diversity of concerns driving them to write. 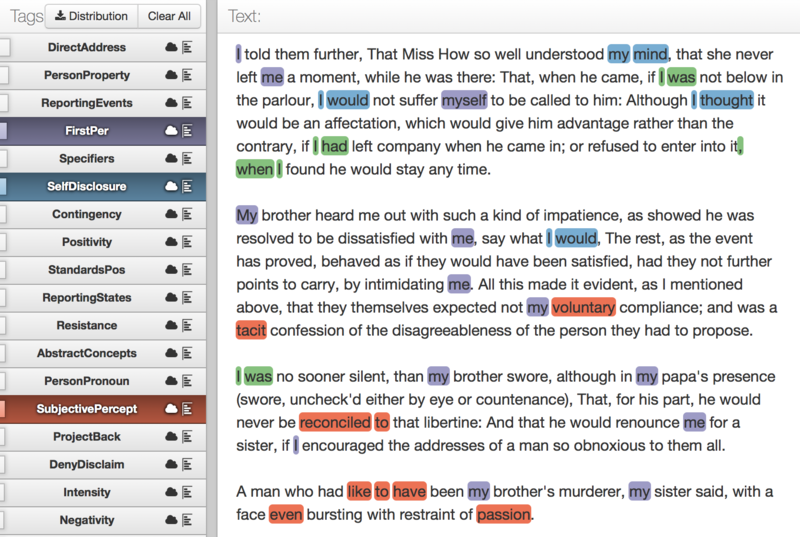 Milton and Defoe, for example, produced texts that distribute in different corners of the PCA map. Shakespeare did not. The story of individual writers is one of greater and lesser variation, but the story of the corpus is one of stability and sameness. Early modern writers and publishers do certain things predictably, something we already knew, but that we can now describe more richly “at the level of the sentence.” Predictability is a function of constraints, some of which apply consistently, some of which loosen over time. Ideologies, for example, are slow to change. Biological limits to human attention are real and change with evolutionary pressures. Most economic and political practices transcend generations. These forces go to work on any act of composition, publication, and even consumption of print; they cannot be dodged. There should, then, be some stability and predictability on the level of the whole, which is what we believe we are seeing here. But constraints do shift, a fact that can be grasped with the study of many more texts than anyone can read. We have tried to create markers for such changes, and to offer interpretations (“urging,” “explaining”) that link those markers to bibliographic traditions and to changes in early modern cultural life (wars, literary fashions). Getting to this point required us to build patterns from the ground up, first from unsupervised statistical analysis, then from contextual, sentence-level interpretation of examples. Now that the corpus is at least minimally interpretable, we do not believe the resulting map and its directions will change significantly. Others can interpret the patterns and the events they correspond to differently, but on a certain level, the findings we present here are descriptive. Certain words and phrases are used more often in the absence of others. Certain periods of time favor different distributions of those patterns. That story is in the numbers. But someone has to look at those words, give a name to those patterns, and explain what they might be accomplishing. We see the latter as the main contribution of this study. Any number of obstacles present themselves to scholars trying to do such work, but we hope we have surmounted at least some of them with the tools available to us. Appendix: Sample texts from 1080 corpus, labeled by genre, and grouped according to favored poles of PCs 1 and 2. Participants in “Recomposing the Humanities,” September 2015. 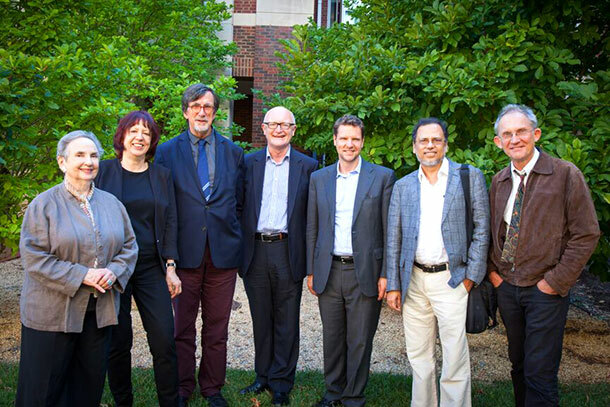 Pictured from left to right: Barbara Herrnstein Smith, Rita Felski, Bruno Latour, Nigel Thrift, Michael Witmore, Dipesh Chakrabarti, and Stephen Muecke. 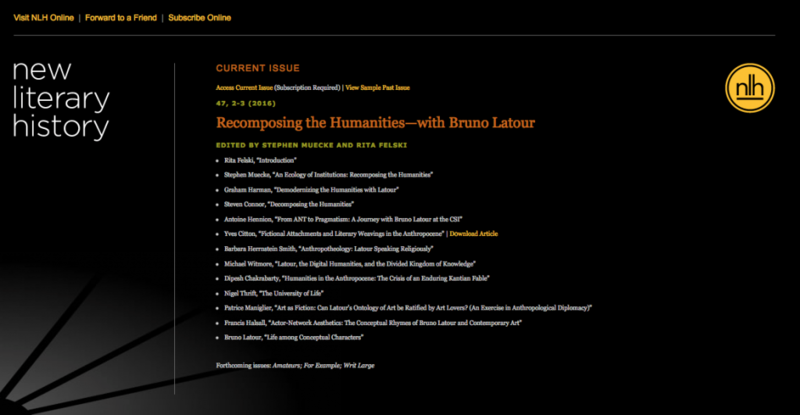 Published last week, “Latour, the Digital Humanities, and the Divided Kingdom of Knowledge” is an article developed from the Recomposing the Humanities Conference sponsored by New Literary History at the University of Virginia in September of 2015. Supplemental digital media for the article can be found here. Abstract: Talk about the humanities today tends to focus on their perceived decline at the expense of other, more technical modes of inquiry. The big S “sciences” of nature, we are told, are winning out against the more reflexive modes of humanistic inquiry that encompass the study of literature, history, philosophy, and the arts. This decline narrative suggests we live in a divided kingdom of disciplines, one composed of two provinces, each governed by its own set of laws. Enter Bruno Latour, who, like an impertinent Kent confronting an aging King Lear, looks at the division of the kingdom and declares it misguided, even disastrous. Latour’s narrative of the modern bifurcation of knowledge sits in provocative parallel with the narrative of humanities-in-decline: what humanists are trying to save (that is, reflexive inquiry directed at artifacts) was never a distinct form of knowledge. It is a province without borders, one that may be impossible to defend. We are now in the midst of a further plot turn with the arrival of digital methods in the humanities, methods that seem to have strayed into our province from the sciences. As this new player weaves in and out of the plots I have just described, some interesting questions start to emerge. Does the use of digital methods in the humanities represent an incursion across battle lines that demands countermeasures, a defense of humanistic inquiry from the reductive methods of the natural or social sciences? Will humanists lose something precious by hybridizing with a strain of knowledge that sits on the far side of the modern divide? What is this precious thing that might be lost, and whose is it to lose? 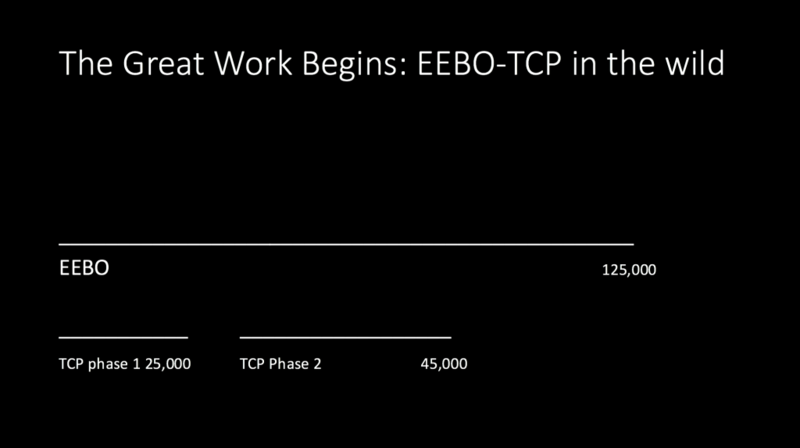 The release of EEBO-TCP phase 1 on 1st January 2015 was a beginning, not an end. This round table will consider the work to be done to, and with, EEBO-TCP: curation, amelioriation, and criticism. What are the ongoing processes necessary to improve the texts and their metadata? Who should carry these out? How can this work be coordinated and preserved? What are the possibilities for teaching and research with the texts? What tools are available now, and what are desirable for the future? What are the limitations of the TCP corpus, and the dangers of the lure of ‘completeness’? Participants have been selected with a view to a focus on the EEBO-TCP corpus itself, what needs to be done to the data in the short and medium term to allow the best possible informed use, and how the subject area should organize itself to achieve this. 0: Jonathan Hope: introductions and overview; difference between EEBO and TCP; phase 1 and phase 2 TCP; what we mean by ‘search’, ‘curation’, ‘modernisation’. The Folger’s Digital Anthology of Early Modern English Drama seeks to become a hub for exploring the dramatic publications of early modern playwrights other than Shakespeare. Building on the transcriptions produced by the EEBO-TCP and the encoding of Martin Mueller’s Shakespeare His Contemporaries project, we aim to present documentary editions of early modern plays in their bibliographic and developmental context. In our prototype metadata portal, constructed by the Roy Rosenzweig Center for History and New Media at George Mason University, you will be able to browse a company’s repertoire, an author’s oeuvre, or a printer’s output, as well as search for a specific play. On each play page, you’ll also see the encoding history of the represented first edition, and follow it from the catalogue record of the library which holds the volume depicted to its EEBO-TCP transcription, access its SHC encoding, and finally read, download, and manipulate it as encoded by the Folger’s Digital Anthology editors. 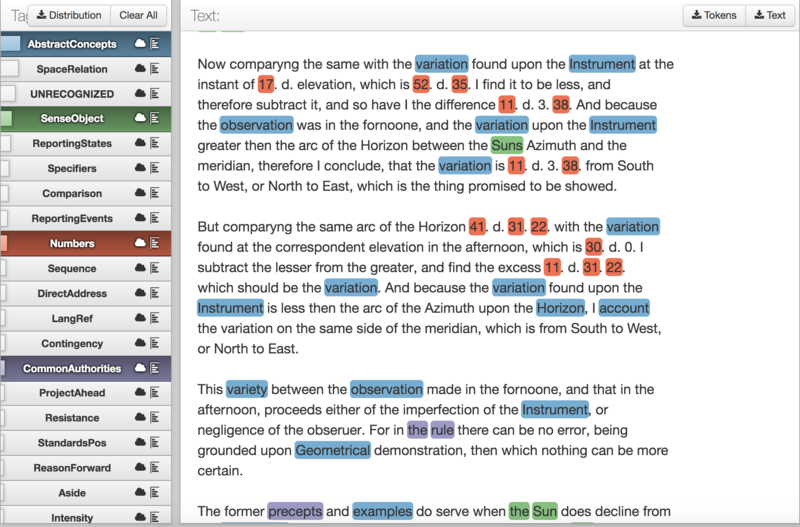 We will provide reliable and flexible encoded texts to serve as the basis for a range of traditional and digital research inquiries, pedagogical exercises, and editorial endeavors, while being transparent about the implications of a corpus derived from individual copies of specific, often problematic playbooks. In June 2016, the Folger will hold the first in a series of workshops to explore the pedagogical potential of this corpus. The Early English Books Online Text Creation Partnership (EEBO-TCP) makes an unprecedented number of early modern texts searchable, which changes the way we research. Now, when faced with print or manuscript miscellany full of, well, miscellaneity, researchers can go about finding out if the commonplaces, epithets, or turns of phrase have potential print sources. Previously, researchers were limited to first-line indices (and therefore poetry), Project Gutenberg’s poor OCR (Optical Character Recognition, automated text digitization), or the un-scholarly “I’m feeling lucky” Google approach. The danger of EEBO-TCP is the myth of comprehensive searching—the lure of the universal library. EEBO-TCP is a carefully selected corpus, but is far from representing all printed works in English. It is especially imperative that students and scholars recognize EEBO-TCP’s (ever-expanding) limits: the size of its corpus, its metadata, and the search functionality. Manuscript studies cannot be separated from texts and book history any more than manuscripts can be disentangled from print sources in the early modern period. EEBO-TCP will make new editions of manuscripts and new digital projects possible; if we can understand the bounds of EEBO-TCP, we can better understand early modern textual cultures. This talk is concerned with satisfying users who need to speak authoritatively about the presence and absence of particular words and phrases in a large dataset such as EEBO-TCP. (A typical application with this need is an authorship attribution study based on preferred phrasing.) As an alternative to providing a website for users to manually enter the terms they wish to search for and, optionally, the relationships between those terms, it is possible to provide an Application Programming Interface (API) that enables the user’s own software to interrogate the dataset directly. It is also possible to provide a Labs service to help users to develop their own software for interrogating the dataset. These various approaches will be discussed in connection with EEBO-TCP, the wider TCP project, and the UK-only rival to EEBO called JISC Historical Texts. The EEBO TCP project is magnficent and flawed. There are millions of known and millions of unknown errors in the digital transcriptions, which, mediated by mobile devices and for better or worse, will provide future scholars with the most common and often the only access to Early Modern print culture. The errors can and should be fixed by users over time. 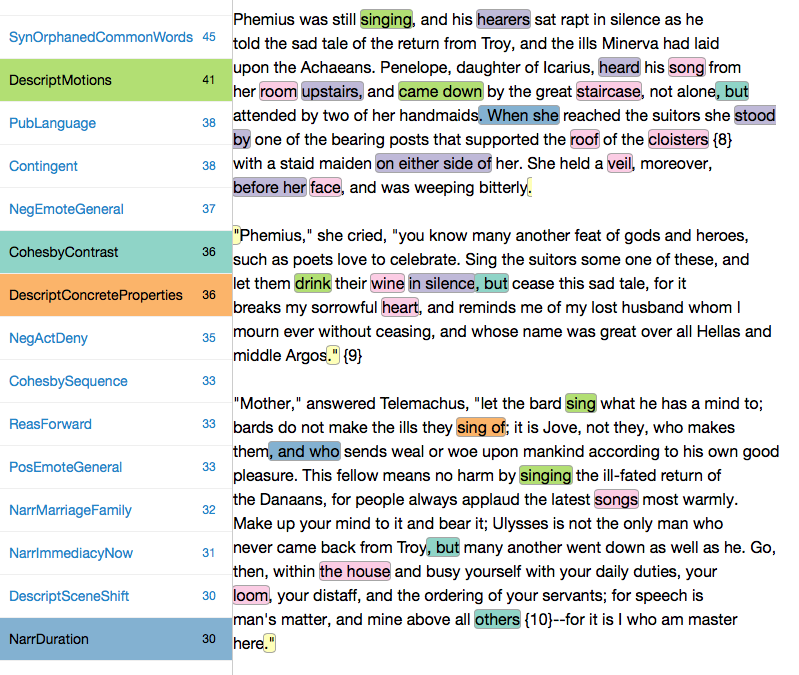 “Citizen scholars” from high school students through undergraduates to retirees can make useful contributions.Over the past two years, Northwestern undergraduates have made substantial contributions to the correction of some 50,000 words in some 500 non-Shakespearean plays from 1550-1650. Experience has shown that some of the work can be “downsourced” to machines. The technical problems for a collaborative framework are not trivial, but with a modicum of trust and willingness to cooperate they can be solved. The key technical problem consists in creating an environment that lets people fix errors ‘en passant, while working with texts they are interested in. An energetic project witt the right balance of some centralization and a lot of distributed effort would produce significantly better texts over a five-year period. Since 1999, the Early English Books Online Text Creation Partnership (EBBO-TCP) has undertaken the gargantuan effort of making publicly available TEI encoded full-text versions of the Early English Books Online (EBBO) corpus. Like all projects of this magnitude, the text transcriptions in the corpus contain a variety of errors and omissions. Whether by hand or computer, textual transcription is a difficult and time consuming task that requires extensive editing and re-editing to produce accurate representations, and EBBO-TCP is no exception to this rule. On January 1, 2015, the EBBO-TCP corpus entered the public domain, opening the possibility for scholars outside of the TCP workforce to contribute to improving its accuracy. This work would, like the original creation of the texts, require a significant effort and would be best achieved by employing a wide and distributed body of scholars. To date, no infrastructure exists for managing this type of distributed textual scholarship. For the past three years the English Short Title Catalogue (ESTC), through the generous support of the Andrew W Mellon Foundation, has been engaged in designing just such a social curation infrastructure for correcting and enhancing the bibliographic and holding metadata in its collection. The designed system, which is currently under production, will provide mechanisms for groups of scholars to engage in peer reviewed records management and improvement. This paper will investigate the ways in which this (or a similar) system could be leveraged to perform social curation of texts in the EBBO-TCP corpus. Jonathan Hope is Professor of Literary Linguistics at Strathclyde University, Glasgow. He is joint P-I on the Visualising English Print project, which is producing tools to work with the EEBO-TCP corpus, and was Director of EMDA2013 and EMDA2015, NEH Advanced Institutes in Digital Humanities, held at the Folger Shakespeare Library. Meaghan Brown is CLIR-DLF Fellow for Data Curation in Early Modern Studies at the Folger Shakespeare Library. Her main project is a Digital Anthology of Early Modern English Drama. She is also the PI on the Identifying Early Modern Books project and writes for Folgerpedia. Anupam Basu is Mark Steinberg Weil Early Career Fellow in Digital Humanities at Washington University, St Louis, where he is part of the Humanities Digital Workshop. 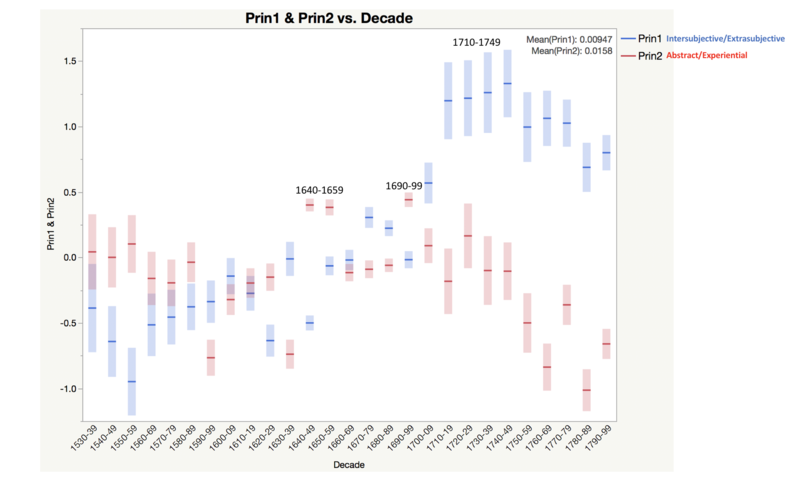 The website Early Modern Print (http://earlyprint.wustl.edu) is leading the way in allowing users to search the EEBO-TCP database. Laura Estill is an Assistant Professor of English at Texas A&M University, where she edits the World Shakespeare Bibliography (www.worldshakesbib.org). She is the author of Dramatic Extracts in Seventeenth-Century English Manuscripts: Watching, Reading, Changing Plays (2015). Her work has also appeared in The Oxford Handbook of Shakespeare, Shakespeare, Early Theatre, Huntington Library Quarterly, Studies in English Literature, and ArchBook: Architectures of the Book. She has articles forthcoming in Shakespeare Quarterly and Shakespeare and Textual Studies (Cambridge UP, 2015). She is currently working on DEx: A Database of Dramatic Extracts. Janelle Jenstad is Associate Professor of English at the University of Victoria. She directs The Map of Early Modern London (MoEML), comprised of a georeferenced critical edition of the Agas map, an encyclopedia of early modern London, a XML library of literary texts, and a versioned edition of Stow’s Survey of London. She is also Associate Coordinating Editor of the Internet Shakespeare Editions, for which she is editing The Merchant of Venice, and Lead Applicant on Linked Early Modern Drama Online. With Jennifer Roberts-Smith, she co-edited Shakespeare’s Language in Digital Media (forthcoming from Ashgate). Her essays have appeared in Shakespeare Bulletin, Elizabethan Theatre, EMLS, JMEMS,and other venues. Carl Stahmer is Director of Digital Scholarship at University of California Davis Library, and Associate Director of the English Broadside Ballad Archive (EBBA). He is Technical Director of the English Short Title Catalogue (ESTC). While in the Marine Corps, Carl worked as a programmer on the ARPANET (Advanced Research Projects Agency Network). He left the Marines to pursue his Ph.D. in English, but the “ARPANET stuck with me, and I began to see strong connections between the way people there were talking about networks and exchange of information and the way people in English Departments were talking about how information gets puts together as narrative”. The data and texts found in this post serve as a companion to my article, “Latour, the Digital Humanities, and the Divided Kingdom of Knowledge” which appears in a special issue of New Literary History, 2016, 47:353-375. The analysis presented in the article is based on a set of texts that were tagged (features were counted) using a tool called Ubiq+Ity, which counts features in texts specified by users or those captured a default feature-set known as Docuscope. The tool’s creation and associated research was funded by the Mellon Foundation under the “Visualizing English Print, 1530-1800” grant. 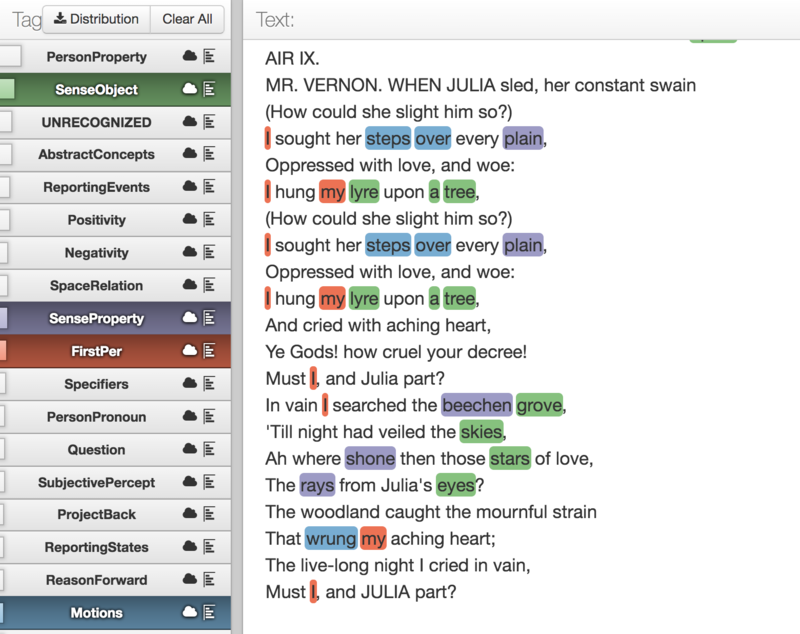 From this post, users can find the source texts, tagging code, data, and “marked up” Shakespeare plays as HTML documents (documents that show where the features “if” “and” or “but” occur in each of the 38 plays). The source texts were taken from the API created at the Folger Shakespeare Library for the Folger Editions, which are now available online. 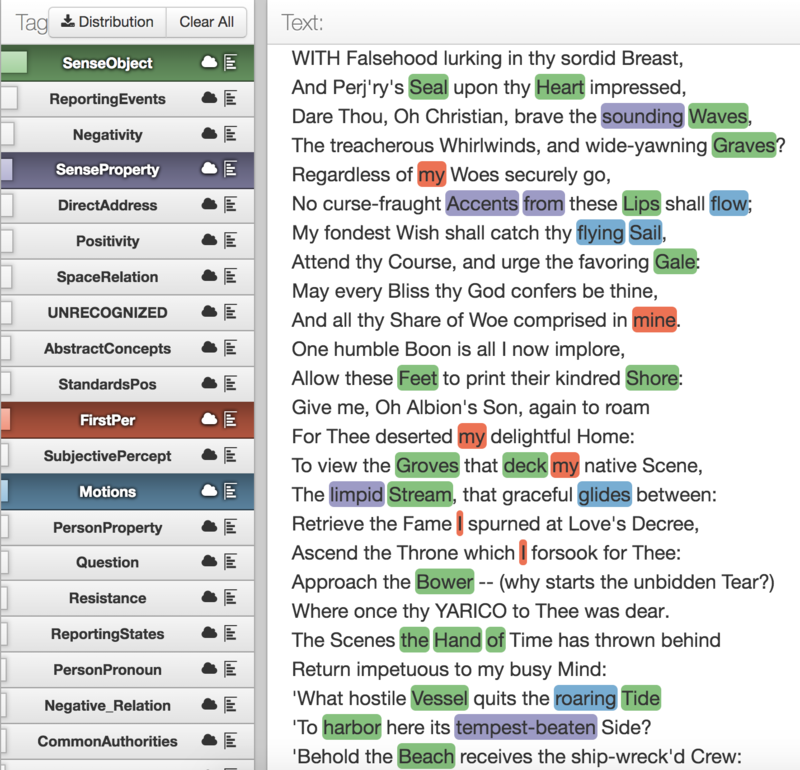 Thirty-eight Shakespeare plays were extracted from these online editions, excluding speech prefixes and stage directions, and then lightly curated (replacement of smart apostrophe with a regular one, emendation of é to e, insertion of spaces before and after em-dashes). Those texts were then uploaded in a zipped folder to Ubiq+Ity, along with a custom rules .csv that specified the features to be counted in this corpus (if, and, but). Once tagged, Ubiqu+Ity returned a .csv file containing the percentage counts for all of the plays. (I have removed some of the extraneous columns that do not pertain to the analysis, and added the genre medatata discussed in the article.) 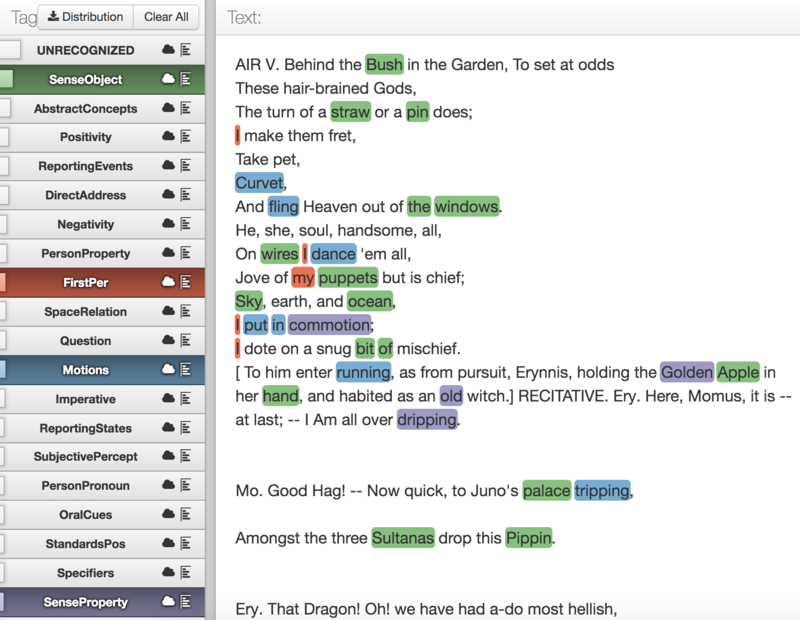 Ubiq+Ity also returned a set of dynamically annotated texts — HTML files of each individual play — that can be viewed on a browser, turning on and off the three features so that readers can see how and where they occur in the plays. Data from the counts were then visualized in three dimensions using the statistical software package JMP, which was also used to perform Student’s t-test. All of the figures from the article can be found here. In the “Fortunata” chapter of his landmark study, Mimesis: The Representation of Reality, Eric Auerbach contrasts two representations of reality, one found in the New Testament Gospels, the other in texts by Homer and a few other classical writers. As with much of Auerbach’s writing, the sweep of his generalizations is broad. Long excerpts are chosen from representative texts. Contrasts and arguments are made as these excerpts are glossed and related to a broader field of texts. Often Auerbach only gestures toward the larger pattern: readers of Mimesis must then generate their own (hopefully congruent) understanding of what the example represents. So many have praised Auerbach’s powers of observation and close reading. At the very least, his status as a “domain expert” makes his judgments worth paying attention to in a computational context. In this post, I want to see how a machine would parse the difference between the two types of texts Auerbach analyzes, stacking the iterative model against the perceptions of a master critic. This is a variation on the experiments I have performed with Jonathan Hope, where we take a critical judgment (i.e., someone’s division of Shakespeare’s corpus of plays into genres) and then attempt to reconstruct, at the level of linguistic features, the perception which underlies that judgment. We ask, Can we describe what this person is seeing or reacting to in another way? Now, Auerbach never fully states what makes his texts different from one another, which makes this task harder. Readers must infer both the larger field of texts that exemplify the difference Auerbach alludes to, and the difference itself as adumbrated by that larger field. Sharon Marcus is writing an important piece on this allusive play between scales — between reference to an extended excerpt and reference to a much larger literary field. Because so much goes unstated in this game of stand-ins and implied contrasts, the prospect of re-describing Auerbach’s difference in other terms seems particularly daunting. The added difficulty makes for a more interesting experiment. I want to offer a few caveats before outlining what we can learn from a computational comparison of the kinds of works Auerbach refers to in his study. For any of what follows to be relevant or interesting, you must take for granted that the individual books of the Odyssey and the New Testament Gospels (as they exist in translation from Project Gutenberg) represent adequately the texts Auerbach was thinking about in the “Fortunata” chapter. You must grant, too, that the linguistic features identified by Docuscope are useful in elucidating some kind of underlying judgments, even when it is used on texts in translation. (More on the latter and very important point below.) You must further accept that Docuscope, here version 3.91, has all the flaws of a humanly curated tag set. 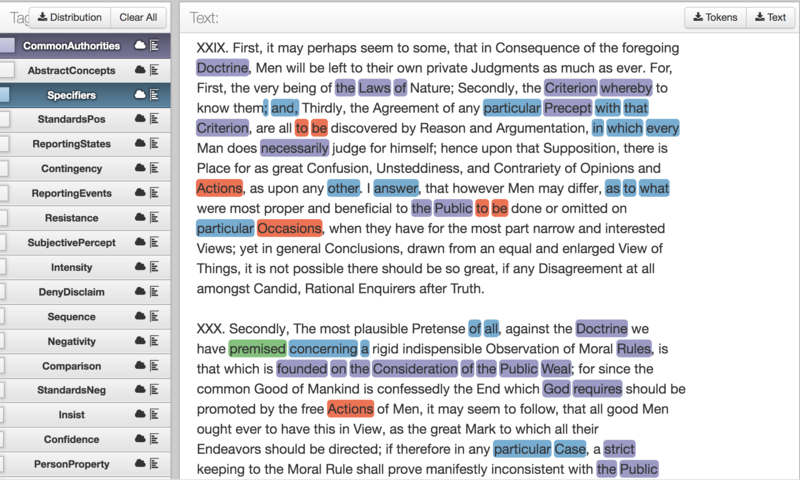 (Docuscope annotates all texts tirelessly and consistently according to procedures defined by its creators.) Finally, you must already agree that Auerbach is a perceptive reader, a point I will discuss at greater length below. There is a lot to work with here, and the difference Auerbach is after is probably always going to be a matter of interpretation. The simple contrast seems to be that between the “equal light” that “floods persons and things” in Homer and the “living dialogue” of the Gospels. The classical presentation of reality is almost sculptural in the sense that every aspect of that reality is touched by the artistic designs of the writer. One chisel carves every surface. The rendering of reality in the Gospels, on the other hand, is partial and (changing metaphors here) shadowed. People of all kinds speak, encounter one another in “their random everyday circumstances,” and the immediacy of that encounter is what lends vividness to the story. The visual and sensory “appear…because [they are] attached to the events which are to be related.” Overt artistry is no longer required to dispose all the details in a single, frieze-like scene. Whatever is vivid becomes so, seemingly, as a consequence of what is said and done, and only as a consequence. These are powerful perceptions: they strike many literary critics as accurately capturing something of the difference between the two kinds of writing. It is difficult to say whether our own recognition of these contrasts, speaking now as readers of Auerbach, is the result of any one example or formulation that he offers. It may be the case, as Sharon Marcus is arguing, that Auerbach’s method works by “scaling” between the finely wrought example (in long passages excerpted from the texts he reads) and the broad generalizations that are drawn from them. The fact that I had to quote so many passages from Auerbach suggests that the sources of his own perceptions are difficult to discern. Can we now describe those sources by counting linguistic features in the texts Auerbach wants to contrast? What would a quantitative re-description of Auerbach’s claims look like? I attempted to answer these questions by tagging and then analyzing the Project Gutenberg texts of the Odyssey and the Gospels. 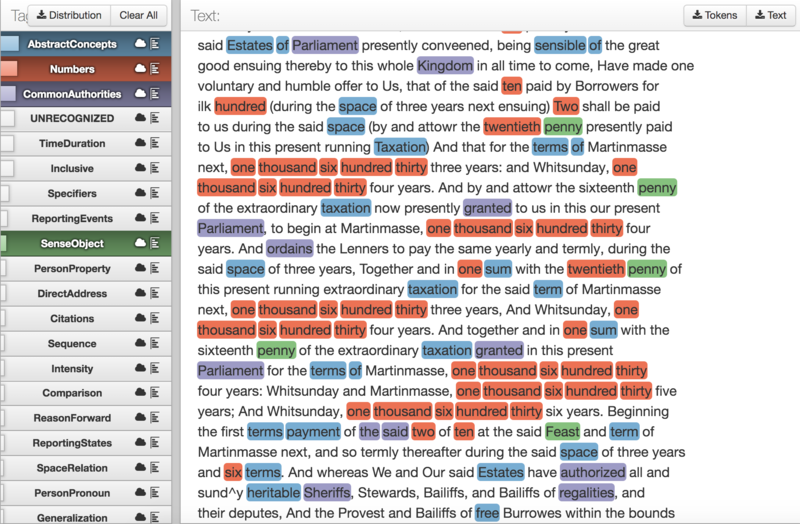 I used the latest version of Docuscope that is currently being used by the Visualizing English Print team, a program that scans a corpus of texts and then tallies linguistic features according to a hand curated sets of words and phrases called “Language Action Types” (hereafter, “features”). Thanks to the Visualizing English Print project, I can share the raw materials of the analysis. Here you can download the full text of everything being compared. 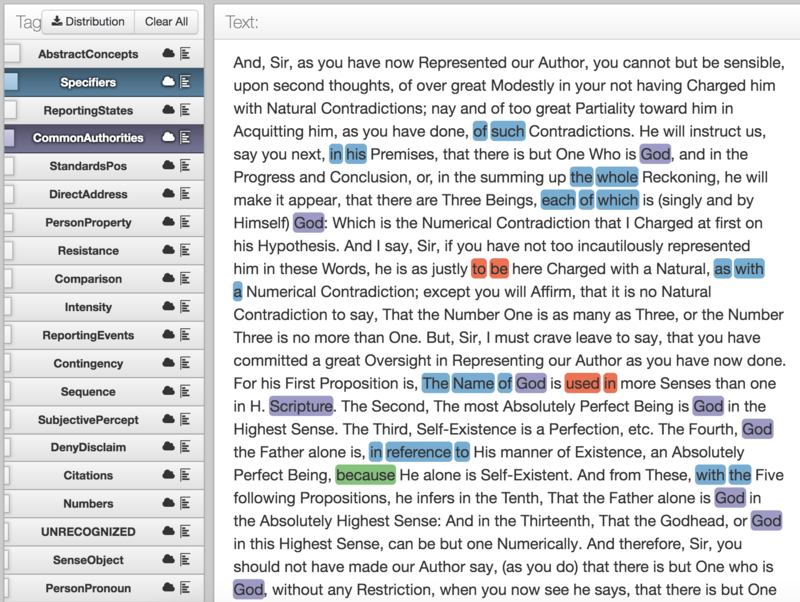 Each text can be viewed interactively according to the features (coded by color) that have been counted. When you open any of these files in a web browser, select a feature to explore by pressing on the feature names to the left. (This “lights up” the text with that feature’s color). I encourage you to examine these texts as tagged by Docuscope for yourself. Like me, you will find many individual tagging decisions you disagree with. Because Docuscope assigns every word or phrase to one and only one feature (including the feature, “untagged”), it is doomed to imprecision and can be systematically off base. After some checking, however, I find that the things Docuscope counts happen often and consistently enough that the results are worth thinking about. (Hope and I found this to be the case in our Shakespeare Quarterly article on Shakespeare’s genres.) I always try to examine as many examples of a feature in context as I can before deciding that the feature is worth including in the analysis. Were I to develop this blog post into an article, I would spend considerably more time doing this. But the features included in the analysis here strike me as generally stable, and I have examined enough examples to feel that the errors are worth ignoring. Notice also the purple features above, which identify words involved in mediating spatial relationships. (I would quibble with “hearing” and “silence” as being spatial, per the long passage above, but in general I think this feature set is sound.) Finally, in yellow, we find a rather simple thing to tag: quotation marks at the beginning and end of a paragraph, indicating a long quotation. The items in cyan, particularly “But” and “, but” are interesting, since both continue a description by way of contrast. This translation of the Odyssey is full of such contrastive words, for example, “though”, “yet,” “however”, “others”, many of which are mediated by Greek particles in the original. When quantitative analysis draws our attention to these features, we see that Auerbach’s distinction can indeed be tracked at this more granular level. Compared with the Gospels, the Odyssey uses significantly more words that describe physical and sensible objects of experience, contributing to what Auerbach calls the “successful cultivation of the visual.” For these texts to achieve the effects Auerbach describes, one might say that they can’t not use concrete nouns alongside adjectives that describe sensuous properties of things. Fair enough. While this is by no means the only interpretation of the role of the words highlighted here, I would suggest that phrases such as “when she”, “, and who”, or “, but” also create the even illumination of reality to which Auerbach alludes. We would have to look at many more examples to be sure, but these types of words allow the chisel to remain on the stone a little longer; they continue a description by in-folding contrasts or developments within a single narrative flow. The dialogical nature of the Gospels is obvious here. Features in blue, indicating reports of communication events, are indispensable for representing dialogical exchange (“he says”, “said”, “She says”). 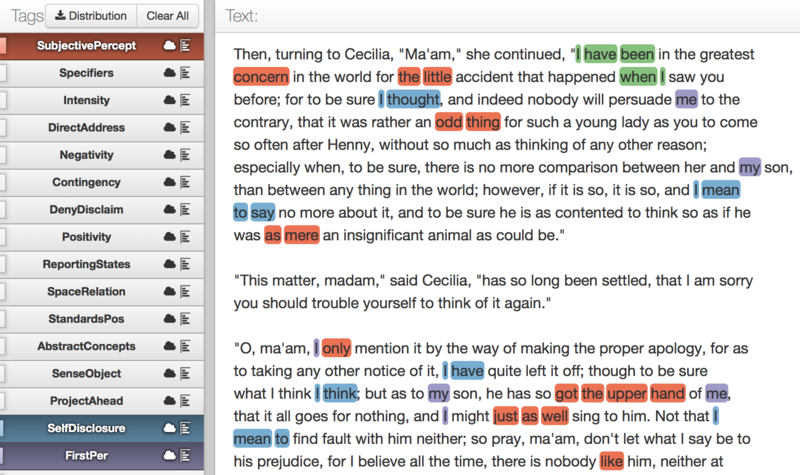 Features in orange, which indicate uses of the third person pronoun, are also integral to the representation of dialogue; they indicate who is doing the saying. The features in yellow represent (imperfectly, I think) words that reference entities carrying communal authority, words such as “lordship,” “minister,” “chief,” “kingdom.” (Such words do not indicate that the speaker recognizes that authority.) Here again it is unsurprising that the Gospels, which contrast spiritual and secular forms of obligation, would be obliged to make repeated reference to such authoritative entities. Features in purple mark the process of “reason giving”; they identify moments when a reader or listener is directed to consider the cause of something, or to consider an action’s (spiritually prior) moral justification. In the quotation from Matthew 13, this form of backward looking justification takes the form of a parable (“because they had not depth…”). The English word “because” translates a number of ancient Greek words (διὰ, ὅτι); even a glance at the original raises important questions about how well this particular way of handling “reason giving” in English tracks the same practice in the original language. (Is there a qualitative parity here? If so, can that parity be tracked quantitatively?) In any event, the practice of letting a speaker — Jesus, but also others — reason aloud about causal or moral dependencies seems indispensable to the evangelical programme of the Gospels. These features introduce a certain strategic indefiniteness to the speech situation: attention is focused on things that are true from the standpoint of time immemorial or prophecy. (“Things” that just “are” true, “whatever” the case, “whoever” may be involved.). These features move the narrative into something like an “evangelical present” where moral reasoning and prophecy replace description of sensuous reality. In place of concrete detail, we get proverbial generalization. One further effect of this rhetoric of proverbiality is that the searchlight of narrative interest is momentarily dimmed, at least as a source illuminating an immediate physical reality. What Made Auerbach “Right,” And Why Can We Still See It? What have we learned from this exercise? Answering the most basic question, we can say that, after analyzing the frequency of a limited set of verbal features occurring in these two types of text (features tracked by Docuscope 3.91), we find that some of those features distribute unevenly across the corpus, and do so in a way that tracks the two types of texts Auerbach discusses. We have arrived, then, at a statistically valid description of what makes these two types of writing different, one that maps intelligibly onto the conceptual distinctions Auerbach makes in his own, mostly allusive analysis. If the test was to see if we can re-describe Auerbach’s insights by other means, Auerbach passes the test. But is it really Auerbach who passes? I think Auerbach was already “right” regardless of what the statistics say. He is right because generations of critics recognize his distinction. What we were testing, then, was not whether Auerbach was “right,” but whether a distinction offered by this domain expert could be re-described by other means, at the level of iterated linguistic features. The distinction Auerbach offered in Mimesis passes the re-description test, and so we say, “Yes, that can be done.” Indeed, the largest sources of variance in this corpus — features with the highest covariance — seem to align independently with, and explicitly elaborate, the mimetic strategies Auerbach describes. If we have hit upon something here, it is not a new discovery about the texts themselves. Rather, we have found an alternate description of the things Auerbach may be reacting to. The real object of study here is the reaction of a reader. Why insist that it is a reader’s reactions and not the texts themselves that we are describing? Because we cannot somehow deposit the sum total of the experience Auerbach brings to his reading in the “container” that is a text. Even if we are making exhaustive lists of words or features in texts, the complexity we are interested in is the complexity of literary judgment. This should not be surprising. We wouldn’t need a thing called literary criticism if what we said about the things we read exhausted or fully described that experience. There’s an unstatable fullness to our experience when we read. The enterprise of criticism is the ongoing search for ever more explicit descriptions of this fullness. Critics make gains in explicitness by introducing distinctions and examples. In this case, quantitative analysis extends the basic enterprise, introducing another searchlight that provides its own, partial illumination. This exercise also suggests that a mimetic strategy discernible in one language survives translation into another. Auerbach presents an interesting case for thinking about such survival, since he wrote Mimesis while in exile in Istanbul, without immediate access to all of the sources he wants to analyze. What if Auerbach was thinking about the Greek texts of these works while writing the “Fortunata” chapter? How could it be, then, that at least some of what he was noticing in the Greek carries over into English via translation, living to be counted another day? Readers of Mimesis who do not know ancient Greek still see what Auerbach is talking about, and this must be because the difference between classical and New Testament mimesis depends on words or features that can’t be omitted in a reasonably faithful translation. Now a bigger question comes into focus. What does it mean to say that both Auerbach and the quantitative analysis converge on something non-negotiable that distinguishes these the two types of writing? Does it make sense to call this something “structural”? If I say, pace Auerbach, that the Gospels are more dialogical than the Homeric texts, and so that English translations of the same must more frequently use phrases like “he said,” the difference starts to feel more inbuilt. You may become even more intrigued to find that other, less obvious features contribute to that difference which Auerbach hadn’t thought to describe (for example, the present tense forms of “to be” in the Gospels, or pronouns such as “whoever” or “whatever”). We could go further and ask, Would it really be possible to create an English translation of Homer or the Gospels that fundamentally avoids dialogical cues, or severs them from the other features observed here? Even if, like the translator of Perec’s La Disparition, we were extremely clever in finding a way to avoid certain features, the resulting translation would likely register the displacement in another form. (That difference would live to be counted another way.) To the extent that we have identified a set of necessary, indispensable, “can’t not occur” features for the mimetic practice under discussion, we should be able to count it in both the original language as well as a reasonably faithful translation. I would conjecture that for any distinction to be made among literary texts, there must be a countable correlate in translation for the difference being proposed. No correlate, no critical difference — at least, if we are talking about a difference a reader could recognize. Whether what is distinguished through such differences is a “structure,” a metaphysical essence, or a historical convention is beside the point. The major insight here is that the common ground between traditional literary criticism and the iterative, computational analysis of texts is that both study “that which survives translation.” There is no better or more precise description of our shared object of study.